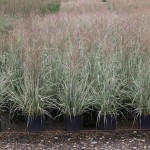 An ornamental grass with white striped green blades. The arching leaves are tinged red in the fall. It blooms in June with upright bronze flower heads, that turn buff as they age. This is a sterile variety. 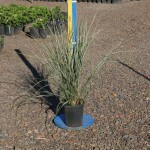 It prefers rich, moist soils that do not dry out, and will tolerate some shade. Cut back clumps in winter, just before the new shoots appear.